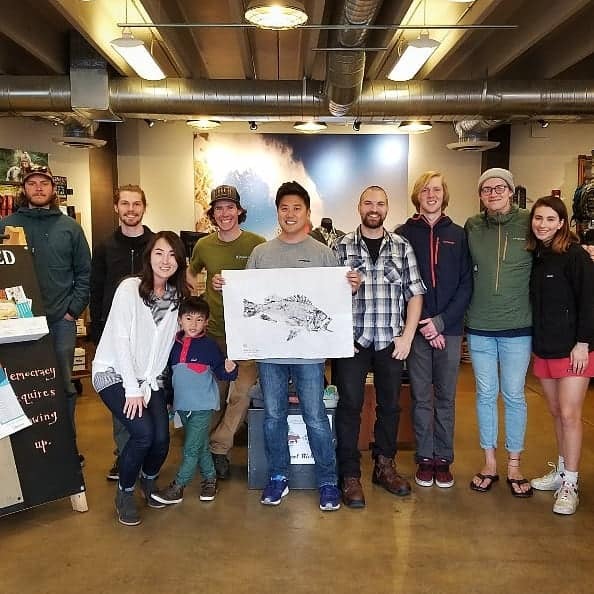 Our third gyotaku demonstration with Patagonia, this time at their outlet store in Salt Lake City!! It’s neat to see how each store differs in personality, but they all share the same gentle passion for the outdoors and a loving enthusiasm for wanting to share it with others. The event was filled with fly fishing enthusiasts, music, food, fly tying, fly fishing films, and lastly our gyotaku demonstration. Absolutely enjoyed every minute of it! “Simple Fly Fishing” Book Launch Event/Demo @ Patagonia HQ!! I had the absolute pleasure of sharing my art in a room (and the back room!) filled with guests celebrating the book launch of Patagonias recent fly fishing book entitled, “Simple Fly Fishing”, which showcases my art on its cover. The feedback was overwhelming, I got to make many new friends and the doors for further collaborations opened up! Not to mention, I got to meet the founder himself, Yvon Chouinard!! What an honor, especially coming from a company that is adheres to its mission statement in protecting and educating, our natural world that we should all be stewards of. Front Cover on Patagonia's Fly Fishing Book!! Happy to announce that one of my trout prints has been chosen to be on the cover of Yvon Chouinard's (founder of Patagonia) fly fishing book entitled, "Simple Fly Fishing"! It's now available for pre-sale on Amazon. Scheduled to ship in November 2018!